The Boise Public Lands Tour is a celebration of streets as places for people in Boise. What makes a good street? Why do we gravitate towards one street over another? Through the National Street Service, we discovered the “why” behind many of these questions. Throughout a 10-week period we observed and reimagined what our streets can be used for. We would love to share with you some of these experiences. Each of our locations highlights one of the important themes we discovered through this experiential program. Reflect on the street- Come along for a guided walking audio tour of the street. Immerse yourself and reflect on what you find to be important attributes of the street through an interactive photo wall. Explore what makes an ideal street. Comfort and Protection- Join us as we explore comfort and protection on our streets. This location has created a safe place for people to interact and engage complete with games and music. What makes you feel safe on the street? Ownership and Permission- Learn a new dance, play some games, and share what permission and ownership on the street means to you. You can join us anytime at any one of the three locations; whichever is convenient. The Boise Trolley will provide a transportation option between each location as it travels in a clockwise direction returning to each location approximately every 30 minutes. Grab a Trolley Pass, a Jr. Ranger kit, and come along! Collect a stamp at each location. 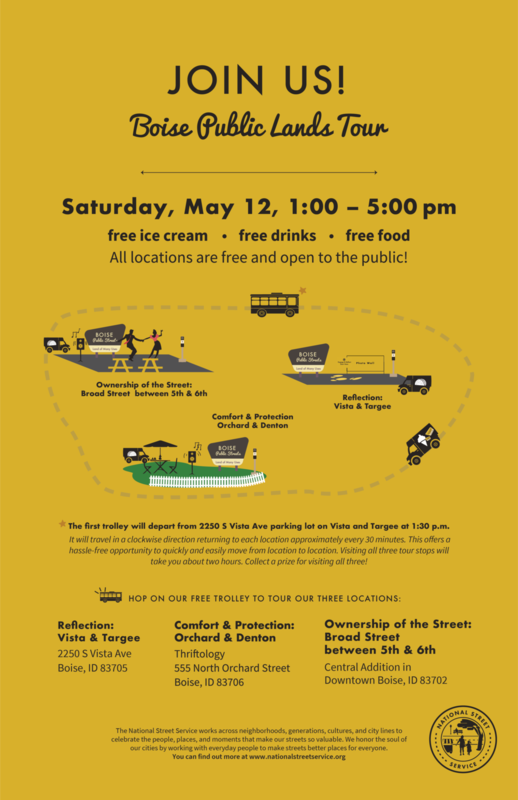 The initial departure of the Trolley will take place at 1:30 p.m. from the corner of Vista and Targee, by the parking lot. Stop by a little earlier to reflect on the street before the Trolley starts its first loop. If not, you can catch the Trolley at any of the other locations. The round trip tour will take approximately two hours to complete. Thank you! We’re looking forward to seeing you soon!